The blues-oriented album of vibraphonist and pianist Buddy Montgomery, This Rather Than That, also includes excellent modern jazz playing. Family ties: Buddy, of course, was the younger brother of Wes Montgomery and bassist Monk Montgomery, who’s also present on this album. Buddy and Monk were ‘buddies-in-crime’ in The Mastersounds from ‘57 to ‘61, a popular, accessible jazz group that also included Wes Montgomery on one album. (Kismet, World Pacific 1958) From ‘55 to ‘61, the three brothers also starred as the Montgomery Brothers, but they played together well into the period when Wes had become a bonafide jazz star. Buddy was part of the tour that ended so tragically with the passing of Wes due to a heart attack shortly after on June 15, 1968, in their hometown of Indianapolis. Also on this album is another Indianapolis-born musician, organist Melvin Rhyne, who appeared on four acclaimed Wes Montgomery albums. An Indy cousin, so to speak. Following the death of Wes, Buddy Montgomery mainly concentrated on jazz education, although he kept on recording sporadically as a leader as well as a sideman with old pals in the late eighties and early nineties. (Bobby Hutcherson’s Cruisin’ The Bird, Charlie Rouse’s Epistrophy, David “Fathead” Newman’s Blue Head) Perhaps a place in the background suited Buddy Montgomery best. Having said that, Buddy’s up front on the front cover of This Rather Than That. What about the fruit and vegetables? I’m not sure what he’s holding in his right hand. Looks like citrus and a pomegranate in his left hand. The symbol of fertility. The Egyptians believed that eating pomegranates granted immortality. The Greek godess Persephones was sent back to Hades every six months because she ate six pomegranate seeds. Heretics say that it was the pomegranate that lured Adam and Eve from paradise. It looks like Buddy is due at the Apollo Theatre for his Wednesday night juggling act. Buddy Montgomery utilised a focused linear approach, quicksilver, definite phrasing and notes that allure like drops of fountain water. His notes ring shortly, matter-of-factly, more in the vein of Lionel Hampton than Bobby Hutcherson. 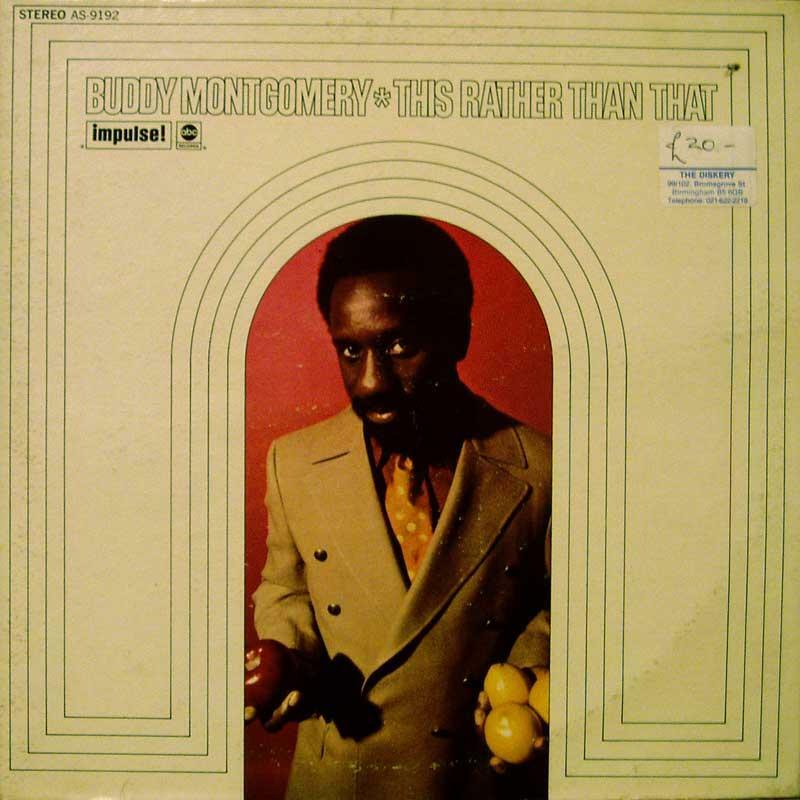 Buddy Montgomery was an excellent, all-round vibraphonist. He’s very compatible with the tasteful Melvin Rhyne, who’s the king of understatement. The blues tracks are backbeat-heavy, funky. Monk Montgomery’s electric bass playing (Monk Montgomery pioneered the use of Fender Precision bass in jazz as early as 1951 and featured it strongly with The Mastersounds) perfectly suit the blues tunes, but seriously barricades swing from the modern jazz cuts, in spite of Monk’s top-notch chops. Fine modern jazz has been played with the use of the electric bass. But to my ears, it has a hard time bringing coherence to the overall jazz sound in comparison to the way the upright bass does. The upright bass is for modern jazz what the rug is for Jeffrey ‘The Dude’ Lebowski: it really ties the room together. Luckily, as in Tin Tin Deo, Buddy Montgomery and Rhyne share swinging responsibilities. Accompanied by deft, chubby organ chords, Buddy’s ultra-fast, probing lines slither like vipers in the grass, constantly moving forward. Rhyne answers the call and, regardless of the fast tempo, patiently builds a story free of clichés and counterfeit climaxes. The group also performs a lush waltz-version of the show tune Beautiful Love. The finishing touch to a quirky but enjoyable album of jukebox blues and modern jazz. I’d not heard of Buddy Montgomery until I read this piece. Your comment about the similarity in function between the upright bass and ‘the Dude’s’ rug was apt and an enjoyably inventive image. I’m looking forward to reading your article on your favourite releases of 2016 later. Slipped through the cracks… Thank you, much obliged! Hope you enjoyed the Flophouse Favorites by now.